So if you know me, you know how much I love baseball. I wholeheartedly believe that life begins on opening day. Well, it's October now, which means we are in the midst of the playoffs. Being a Cubs fan, that usually means nothing. But this year, they are IN! Thanks to social media, there are some great hostages surrounding the team. #FlyTheW seems to have caught on the most. Yes, I own a W flag and display it proudly after they win (when I remember). We took this photo last week after the Cubs downed the Cardinals to make it to the NLCS. I created the page right away, but due to cloudy weather, wasn't able to photo is until yesterday. I knew Doodlebug had new sports lines coming out, but was told they weren't arriving in stores until November. I was thrilled when I walked into my LSS to find a huge display! I bought all of the baseball, 3 times over, and used it all up! 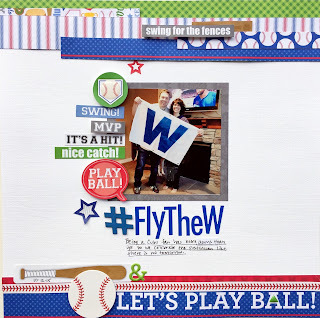 I'm taking advantage and playing along with Paper Issues Fan-Atic Issue as well as Scraplift Sunday. Thanks for taking a look at my creative view today. Come back again soon, I always have something to share. Good morning! It a double post day for me, which means I've had time to play. It's time for the second sketch challenge at Stuck?! Sketches. Before we get to my page, Here is the sketch and our awesome sponsors. 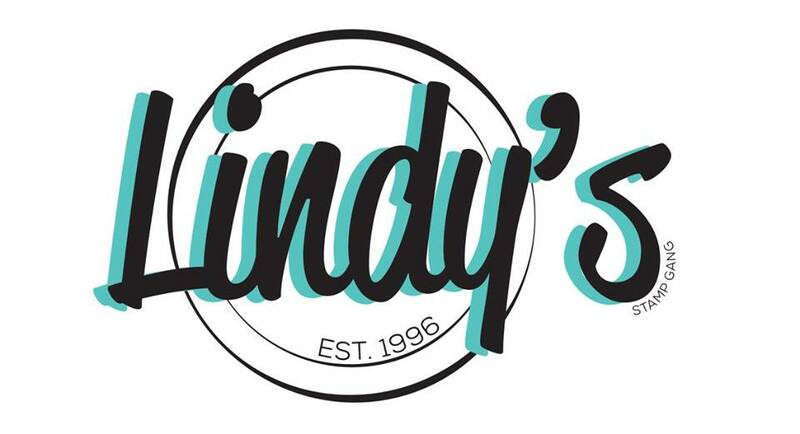 Both Scrapmatts and Lindy's Stamp Gang have offered prizes. You have an opportunity to win 2 chipboard sheets and/or a $25 Gift Certificate. Please check the Stuck?! 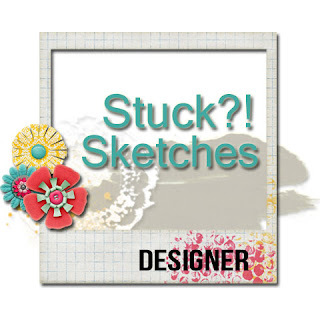 Sketches blog for rules and more details. Now, here is my page based on our sketch. If you know me, I'm a rule breaker. So, I wanted to play with the oversize background shape, but still keep the integrity of the sketch. So I did! I cut the oversize award ribbon, but used it more as a title block than background. Covering it up would have defeated the purpose. I definitely changed the shape of the design by using two portrait photos as well. But, as you can see, the rest of the sketch is there. We were at my son's swim team banquet. Of course as soon as we walked in, I was a stranger to him. Butter he received his certificate, I received that text from him. It made my night. Although he is a teen and wants to distance himself from his parents, he thought enough to share his news and excitement with me in a subtle way. My how technology can work in our favor sometimes. The journaling is a message back to him reminding him to keep feeling what he felt in that moment. Thanks for stopping by my creative view today. Come back again soon, I always have more to share. Hello! I have here today the newest challenge at Picture This. Are you ready? Two photos, no problem. Polka dots, also no problem and this page is all about family. I actually ket the polka dots in the background. Literally. It's the red background paper. The banner is also polka dots. I used a bunch of 3x4 cards from a family themed collection to create the quilted matte under the photos. It another nod to the theme of the page. 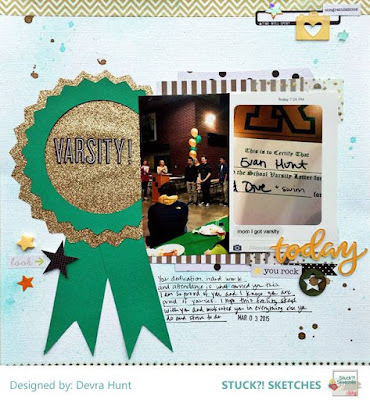 Add some embellishments that also speak to family and the page is complete. 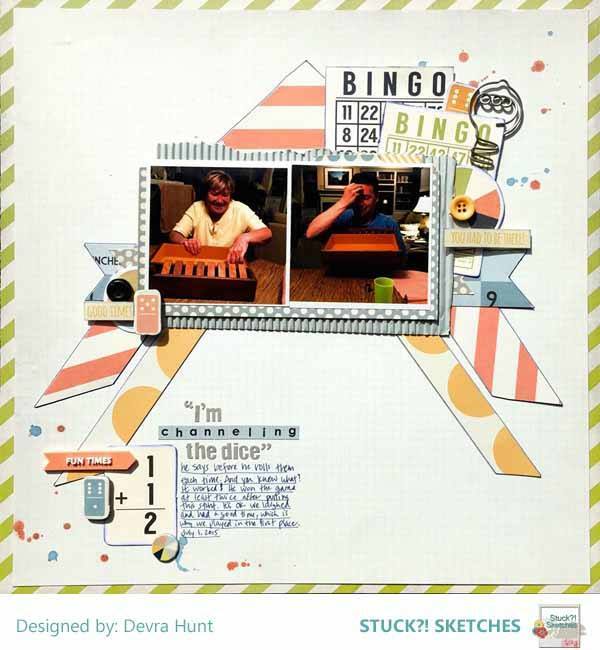 I chose a sketch from Boys Rule Scrapbooking as the design of the page. I used full 4x6 photos so the entire layout design is extended. I love the end result. I love these photos and will probably scrap them again so I can tell a different story. For now know that these are the last photos of my son and Grandfather together. I look at them with joy and sadness at the same time. For the most part, that's what the journaling says. Good morning! 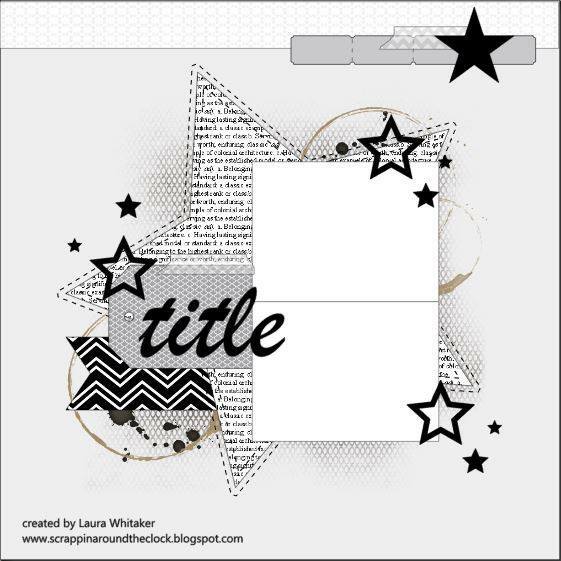 It's Tuesday, and on the Get It Scrapped blog is a new article in the speed up your scrapping series. 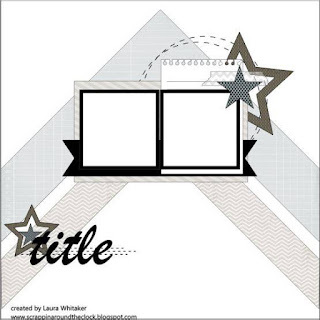 Today's topic is creating 2 page layouts using different backgrounds on each side. I make 2 page layouts often, but I use the same paper background on both sides. This was a good exercise for me. I chose two basic prints, dots and stripes and added some large floral prints, reminiscent of my Grandma's house. I united the two sides by adding strips of the stripe and floral papers to the bottom of the right page. I repeated the colors with embellishments on both pages. My friends and I got together one afternoon to bake challah. I hadn't done it since I was a little girl. Not only did we have fun, I was reminded how easy it is to do. We've already talked about getting together again this fall for round two. Thanks for stopping by my creative view today. I've been busy creating, but not so busy writing. I have some posts to catch up on. So come back again soon to see what's new. Well good morning! Yes, today is a double post day for me, and a very exciting one at that. I have been asked to join the Stuck?! Sketches Creative Team, and today is my first reveal. is offering a one year subscription! Now, on to today's sketch and layout reveal. Here is the sketch. I like it! It's different! Here is my page. I kept the idea of the sketch, but adjusted the size of the angles. Want to know how the page began? With the small triangle scrap of the pink striped paper. From there I cut more of that paper, then just kept going with more prints and colors from the same collection. I balanced the colors and the size of the prints to make it all work together. I chose these papers because of the game piece die cuts. I was so excited to use them! While visiting family this summer, we spent an evening playing a game together. My husband really got into it, becoming silly and competitive. In order to win, he started talking to the dice and "channeling them" to roll the right numbers. you know what? It worked! That made the night even funnier, and my husband more competitive! Thanks for stopping by my creative view today and sharing in my good news. I've got all kinds of these to share, so come back again soon. Three photos are never a problem for me. I have a hard time choosing and editing photos. I grabbed a template from the Get It Scrapped Half and Half Scrapbook Coach lesson for some help in page design. The frame and larger alpha are chipboard. I stamped in the middle of my journaling. 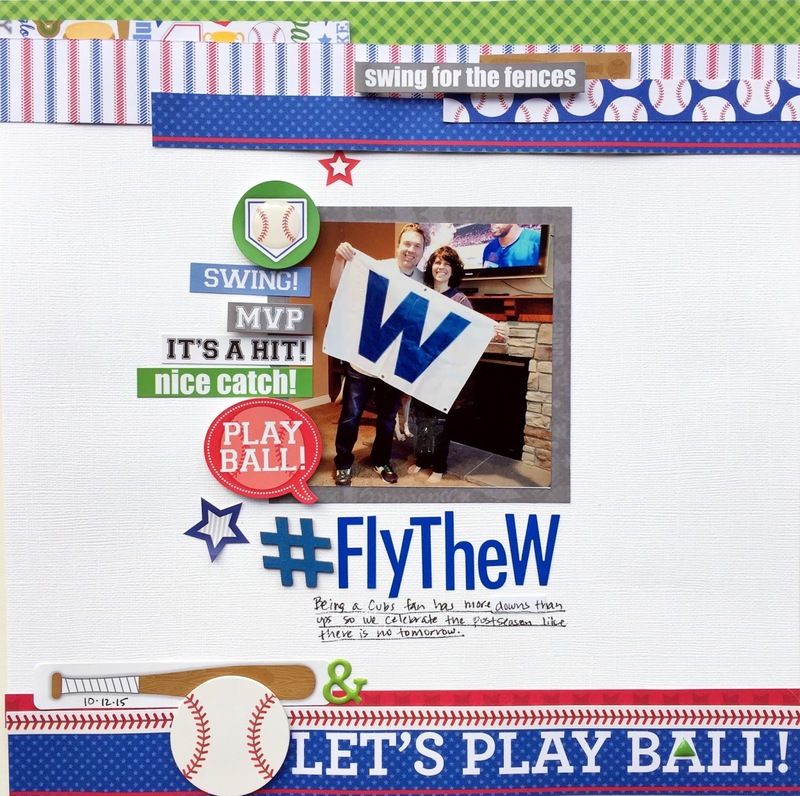 I chose some high energy papers and embellishments to help tell the story. I originally was going to stamp on raw chipboard. I got carried away, in a totally different direction, but I am so happy with the way it turned out. As the journaling reads: This is one of those "oh, look what he can do! Oh crap, look what he can do!" moments. I left the room for a moment and came back to this. He is my ever curious, daredevil, no fear, child. I would have it any other way.